It seems to me that we see three kinds of behavior in the world of media. We have the traditionalists, who love print and traditional publishing. And if they could decide, the new world should be banned. They see digital as having a negative impact on their craft. These are the types of people who still buy LPs, and play them on vintage LP players because that makes it more 'authentic'. Then we have the futuremaniacs, who discard the past at all cost. These people will go out of their way to do the opposite of whatever they define as being the past. If they see an article writen with only text, they will proclaim that articles should all be interactive infographics. Whenever they see a book, they proclaim it should really be a game for the smartphone. The problem with these two groups is that one never evolves (like the Amish people), and the other never learns. I believe the best approach is to always be inspired by the past, but we shouldn't live in it. 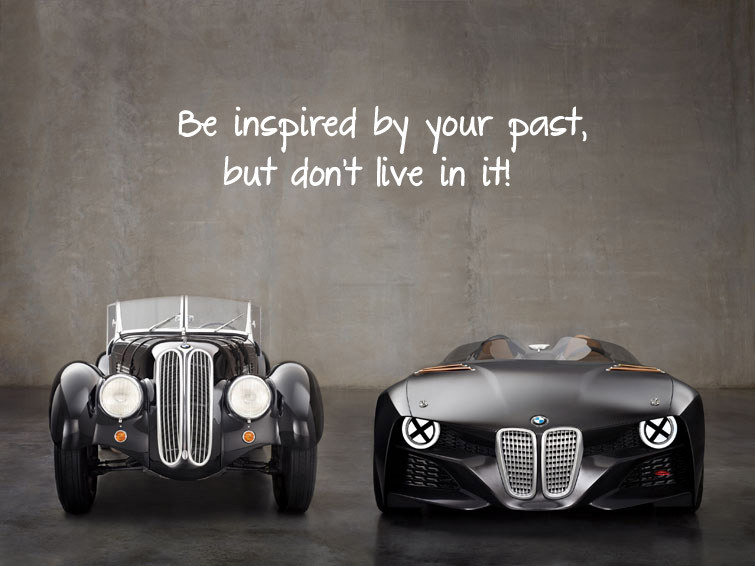 Note: picture from the BMW 386 Hommage. The challenge is to figure out which is which. What part of it is inspiration, and what is really a limitation. Take the format of a book. Is that format part of the inspiration of what the book creates? ...or is the act of flipping pages and the book itself a limitation of the past? I believe that the book itself is a limitation of the past, but that the concept of providing a story by taking away as many visual cues as possible is what makes it alluring. I love reading a book and being forced to use my brain to imagine what that world looks like. If the book instead showed me a picture, that magic evaporates. Always remember that. Always ask, "What is a limitation? And what is inspiration?" Head over to G+ to comment or discuss this article.